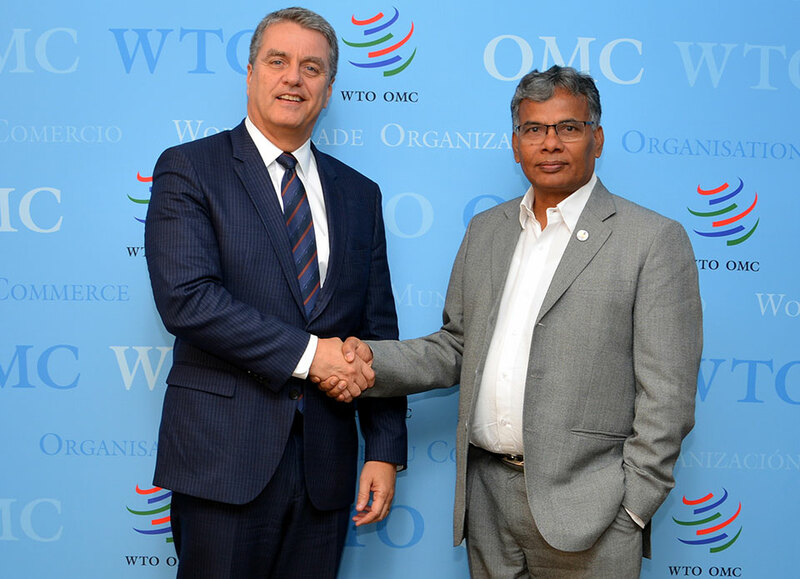 KATHMANDU, Oct 23: Minister for Industry, Commerce and Supplies Matrika Prasad Yadav has held a meeting with Director General (DG) of the World Trade Organization (WTO) Roberto Azevedo on Tuesday at the latter’s office. A number of trade related issues ranging from challenges of multilateral trading system, state of play in trade negotiations at the WTO, and the issues and concerns of LDC in general and Nepal in particular were discussed during the meeting, according to a press statement issued by Nepal's Permanent Mission to United Nations in Geneva. Minister Yadav, who is on a visit to Geneva, appreciated the Director General’s supportive role to the LDC. The minister asked the WTO to provide continued technical support to Nepal in enhancing trade related capacity. On the occasion, the minister underlined the coordinating role of the WTO for multi-donor support to implement the trade facilitation agreement. Referring prosperous Nepal, happy Nepali as the long-term objective of the present government, the minister requested for continued support from the WTO and other development partners to achieve its overarching goal of sustainable development by exploiting its enormous untapped resources, according to the statement. Indicating the global trade tension and impasse at the WTO negotiations, WTO Director General Roberto Azevedo underscored the need for support of all members as every country has to suffer from its systemic failure. "The DG also wished successful completion of 2nd trade policy review of Nepal which is taking place in December this year. The indicated that the WTO could play a facilitating role, under the DG’s leadership, for global dialogue to find out the practical solution of the WTO impasse," read the statement. Secretary at Ministry of Industry Yam Kumari Khatiwada, Nepali Ambassador to United Nations Deepak Dhital, Deputy Permanent Representative (Commerce) Mina Aryal were present during the meeting. Minister Yadav is attending the 'UNCTAD’s World Investment Forum 2018', which has been taking place from 22 to 26 October at Palais des Nations, Geneva.